Currently, an estimated ten million Americans suffer from osteoporosis, causing more than a million fractures, including hundreds of thousands of hip fractures, a common reason people end up in nursing homes. Many older women say they’d rather be dead than break their hip and end up in a home. We are in an epidemic of osteoporosis. Ten million Americans have it, and one in three older women will get it. We urgently need public health strategies to maintain bone health, and prevent osteoporosis. Might fruits and vegetables be the unexpected natural answer to the question of osteoporosis prevention? This is part of an article by David Goldman R.D. It originally appeared in the Spring 2016 issue of Health Science magazine, the member magazine of the National Health Association. There are few things more heavenly than the scent of hot lemongrass tea. It’s delicious iced, too, and you might be surprised to learn that drinking lemongrass tea goes well beyond its taste and aroma. It has an amazing number of health benefits, both for your bones and overall health, all backed by scientific research. So if you have it on hand, go ahead and grab a cup of lemongrass tea and enjoy today’s post on this fragrant topic! 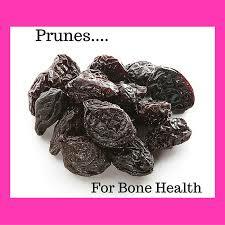 Dried plums — or prunes — are among the highest antioxidant foods shown to help improve bone strength. However, in early studies, the level of prune intake originally found to bone-enhancing was fairly high at 100 grams, or 10-12 prunes a day.